Do I need a license to fish my own pond? There’s no license or limits on landlocked ponds located on private land. A reader recently asked the question, “Do I need a license to fish in my pond?” The answer is, usually, no. But in some cases, pond owners and landowners actually do need a license to fish on their own property. The basic rule of thumb is this: if you own the entire pond, and the pond isn’t connected to public waters by a stream, river or canal, you don’t need a license. But if water comes directly into or flows out of your pond, and that water is accessible by the public, you need a license. Also, if you own land on a public lake, river or other waterway, you need a license because you don’t own the water. The fish in a wholly enclosed farm pond that has no access to public waters are technically owned by whoever owns the pond. So you don’t need a license. But if fish can come in and out of the pond freely through public waters, then those fish belong to the public. And in that case, you need a license to fish. And those cases are more common than many people realize. I have a friend who owns several hundred acres of swampland. He has a small pond on part of that land. The pond is completely on his land, but a canal connects the pond to a stream that runs through his property. This stream connects to a river, a public waterway. The fish can swim in and out of his pond from public waters. Technically, he needs a license to fish in his own pond. The same friend has another pond at his house. This pond is completely encircled by land he owns. No public waterways connect to this pond, and the fish are all trapped inside the pond. He does not need a license to fish there. 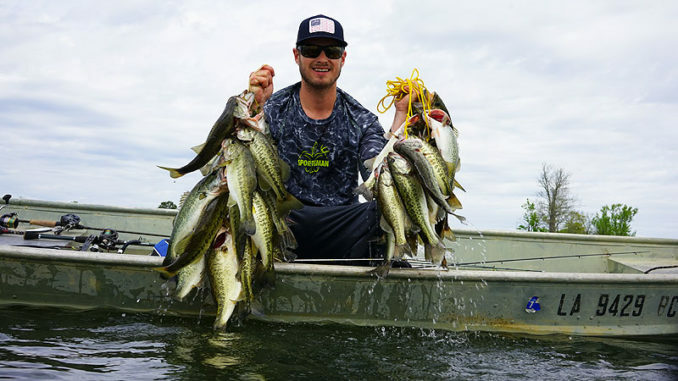 If you’re trying to determine whether you need a license to fish in your own pond, ask yourself whether fish can move in and out of your pond by way of public waters. If they can, you need a license. If they can’t, all you need is a fishing pole. What will it take to win the D’Arbonne National Crappie Championship?